Butterfly witness pins for Greek Orthodox Baptism for girl. 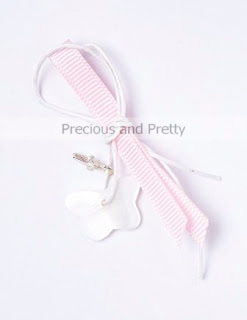 White wax cord tied with a pink ribbon from which is hanging a metal cross and a white shell butterfly. https://www.preciousandpretty.com/2017/02/greek-martyrika-butterfly-for-girl-kl24.html Greek Wedding Favors|Orthodox Crowns|Stefana|Baptism Invitations Greek martyrika butterfly for girl KL24 Greek martyrika with butterfly and cross for girl Product #: Greek Wedding Favors|Orthodox Crowns|Stefana|Baptism Invitations_4843285625964221585 5 stars out of 5 reviews.